Since learning of Caroline’s giftedness (2e), the past year has been a huge learning curve for me. I’ve had to rethink so much about learning and parenting. 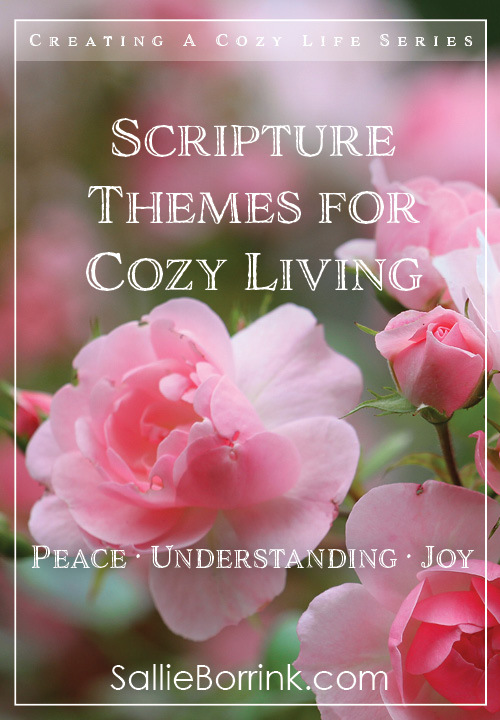 Because I’m a Christian, I think about these topics in the context of my faith. 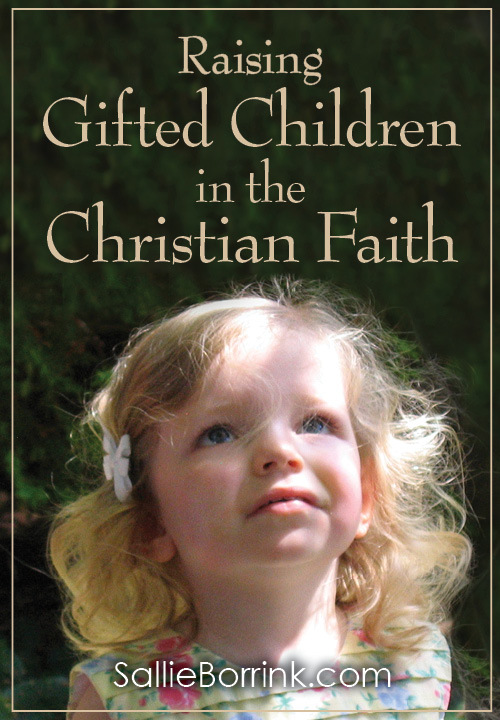 I realized at one point that there is very little out there about raising gifted children in the Christian faith. There is a great deal about gifted children and there is plenty about Christian parenting and homeschooling. But both? Not much. 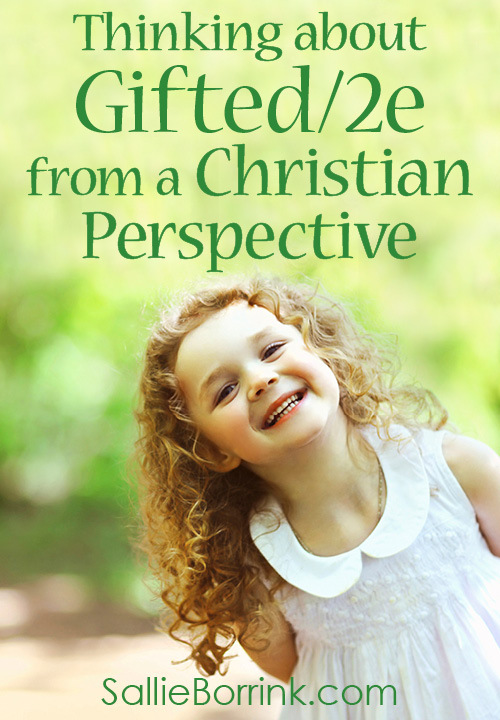 I brought up the subject of raising a gifted child in a Protestant faith tradition in a gifted homeschool bloggers group. 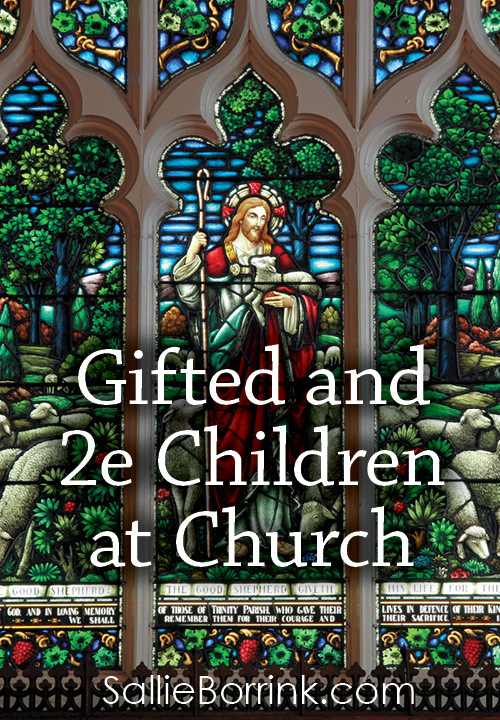 We had a thought-provoking discussion about the challenges and opportunities as Christians with gifted children. This series of posts is a result of my experiences as a parent and that conversation. I hope it will be a helpful series for people who are wrestling with some of these same issues and will spark some good discussions. But I Don’t Have a Gifted Child! In short, if you work with or interact with someone else’s children on a regular basis, I promise you will find something in this series that will help you understand how to best help and love a gifted child. What is it about raising a gifted child in the Christian faith that presents a unique set of struggles? I’ve observed some things that I think are very important. How do you respond when gifted children often interact with matters of faith very differently than a neuro-typical child? How do you raise gifted children in Christian community when they don’t especially like groups and find church overwhelming? 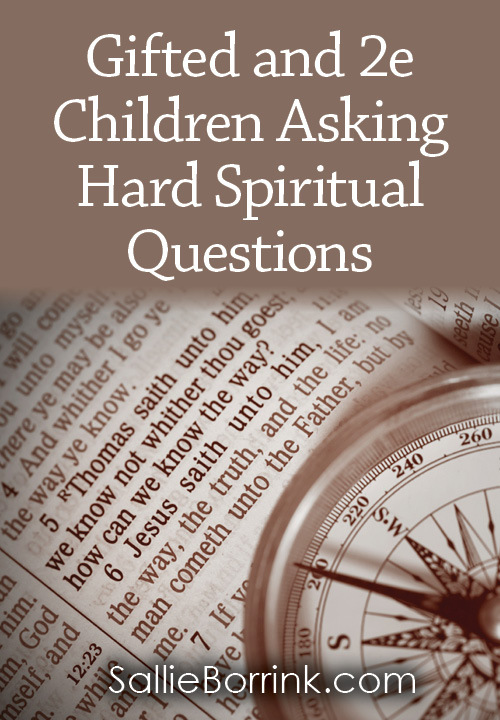 How do you instruct a child in the faith when he doesn’t like to be instructed in the typical ways churches function or simply doesn’t like instruction because of the way he is wired to learn? How do you effectively discipline a gifted child? 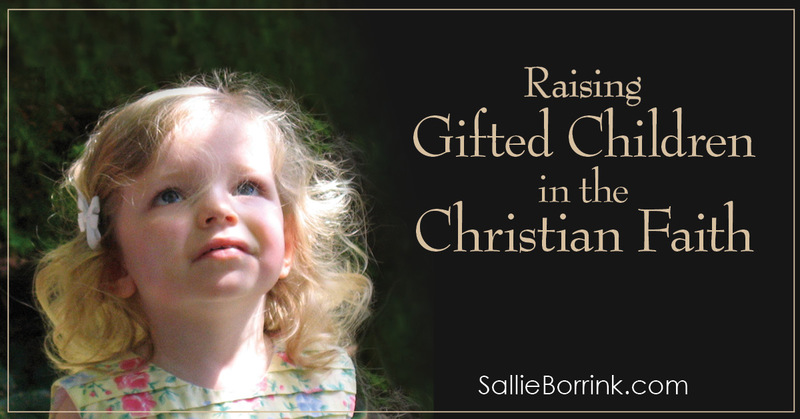 How do you raise your child to understand that it is fine to be gifted and also be a person of faith when the gifted community is often hostile to Christianity or say they are mutually exclusive? How do you support gifted children who often feel the weight of the world on their shoulders? Those are some of the questions I’m going to touch on with this series. I hope you will find it helpful. If you are a parent of a gifted/2e child, I hope you will leave a comment and share what has worked for you in these different areas. I do not profess to be an expert in any of this! I’m simply hoping to facilitate a helpful conversation. You might have the answer another parent needs! A couple of words of clarification. I know the term “gifted” is controversial. I’ll be explaining what I believe gifted is and isn’t in my next post. I’m also writing this series from the perspective of a right of middle, Bible-believing, Gospel-preaching Protestant Christian because that is my sphere. It isn’t my intention to slight people of other faiths, but the historic Christian faith is the frame of reference for my life and so that is why it will be the basis of this series. Certainly anyone of other faith traditions (or no faith) is welcome to read and discuss. However, the series is not open to questioning the validity of the Christian faith, the Bible or giftedness. Comments of that nature will be deleted in order to provide a safe place for Christian parents to discuss. Thank you! 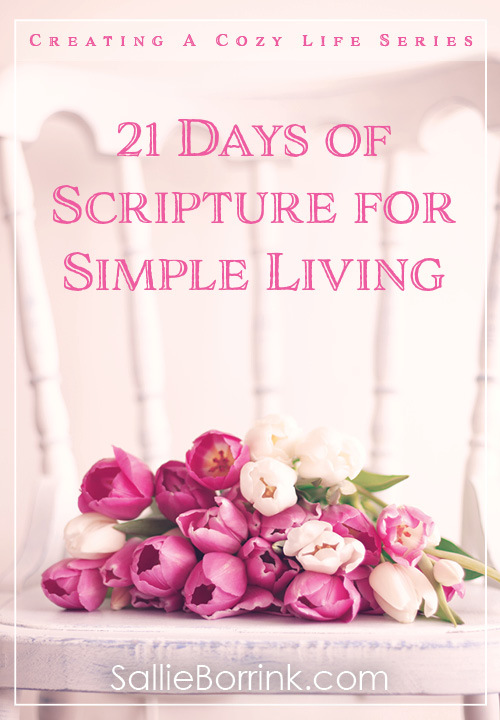 One of the most challenging things for our family has been the area of discipline/obedience. Of my four kids, only one would be described as compliant. With the other three, we have to do quite a bit of explaining, discussing, compromising, and just letting some things go. This concept can be very foreign to many people who expect/demand immediate obedience and compliance from children. I have felt the stares on more than one occasion from people who have no idea that my kids just don’t operate that way. I hear you!!!!! 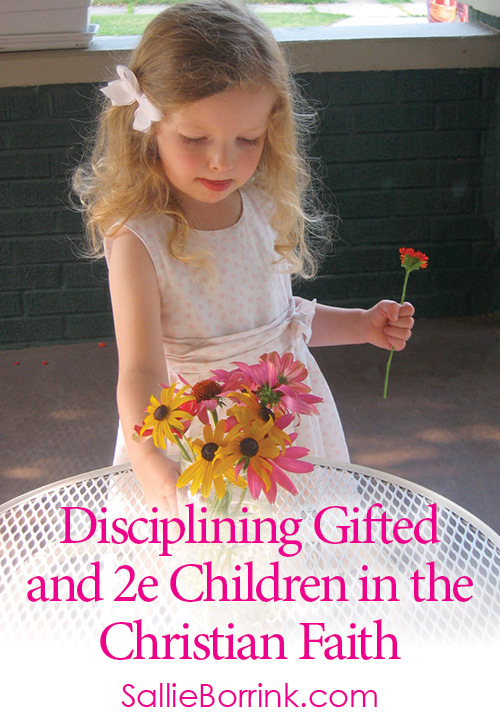 I have an entire post in this series about how to discipline gifted children. It’s a HUGE issue for us as parents that people don’t understand looking in from the outside. Thank you for undertaking this topic! As a Christian gifted adult with 4 gifted kids it is a challenge to help them navigate church life. All of them have a strong faith that they own as their own. We have had seasons where I had to pull them out of activities because although the environment was small enough for one on one adaptation those leading just could not accept/understand how giftedness could so profoundly affect what the child needed. I have looked for discussion of this on and off for several years and this is the first I’ve come across. Thank you for your comment! I hope you will add your perspective in the comments on the various posts. I don’t profess to be an expert in this at all. I’m still figuring it out. But, like you, I felt there was a need for this conversation to happen since it is a real issue. I think as gifted Christians and/or Christians raising gifted children it really feels like a path those around us don’t understand. Would you be willing to share the ages of your children? Our Christian family (Evangelical Protestant tradition) is in the same boat with 2 gifted children (now 12 & 14). Though they will not be children a few years from now, I pray I will still gain precious insight through your website which uniquely fits our needs as a Christian homeschooling family with gifted children.